Heartbreak, unemployment, fire, and now embarking on another open-ended journey (I’m on the way to the airport as I write this draft). If this year has a theme for me, it’s definitely “letting go”. It’s hard to let go. I don’t know if it’s true, but I heard that newly born babies have such strength in their hands that they can grab something and hold their weight. So it seems that we’re born with the ability to grab and hold on. And then we spend the rest of our lives learning to let go, until our moment of death when we finally let go of life itself. What makes letting go particularly difficult for me, at times, is the fact that I’m a pretty tenacious guy. In many situations, that’s a virtue. If there’s something I want to accomplish, or a problem that needs to be solved, I’ll keep at it until I succeed. This trait has gotten me pretty far in life, and it’s something I’m proud of. But, sometimes, our gifts can also be vices, when applied in the wrong context. Sometimes, I need to make the difficult decision to let go, rather than to endlessly attempt to solve an intractable problem. One tool I’ve come to appreciate in such difficult processes, is a ritual of some sort. I haven’t always been a big fan of rituals, having been exposed to quite a few of them through my Japanese heritage. The inexplicably rigid format of old rituals felt mechanistic, and I didn’t understand their underlying purposes or intentions. But, as I grow older, I’ve come to appreciate rituals for what they are: a way to externalize, visualize, embody, or make tangible an internal and invisible process, often in the presence of witnesses. One ritual I enjoy and actively take part in, is the act of burning, which I experience annually at the Burning Man festival where a giant man-shaped effigy, a large temple, and other large pieces of art are burned every year in the vast emptiness of the Black Rock desert in Nevada. One of the wonderful things about burning is that it can symbolize and represent almost anything you want. To burn something, you need to create something to be burnt, which in itself can be a satisfying and meaningful endeavor. And when you light up a giant (non-destructive) fire, it almost always evokes a sense of wonder and beauty, and a sense of celebration. Or, burning an effigy can represent conquest, victory or at least resistance and rebellion. And burning something of value can symbolize a form of release and catharsis. So, when I recently made the difficult decision to finally let go of a really amazing lady I madly fell in love with last winter and clung to for way too long after our attempted relationship fell apart, I decided to build something and burn it. 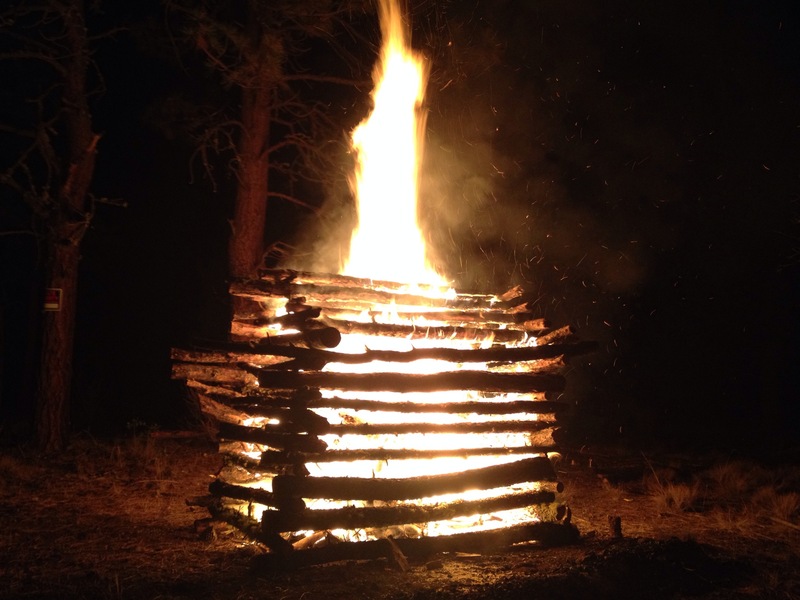 After some thought, I felt it would be fitting to build a log cabin-shaped pyre to represent the hopes and dreams I had for a future with her, and then to burn it down to express my commitment to letting go. I told a few neighbors about this plan, who eagerly joined in on the project, and we spent an afternoon collecting fallen trees and felling skinny struggling trees from my pine forest. That process served the triple purpose of supplying building materials/fuel for our project, removing fuels from my woods to reduce the impact of a potential fire, and culling stragglers to give stronger trees more room to grow. Incorporating local sustainable materials and employing forest stewardship practices seemed only fitting considering how our shared love of nature and passion for environmentalism were partially what had brought she and I together. 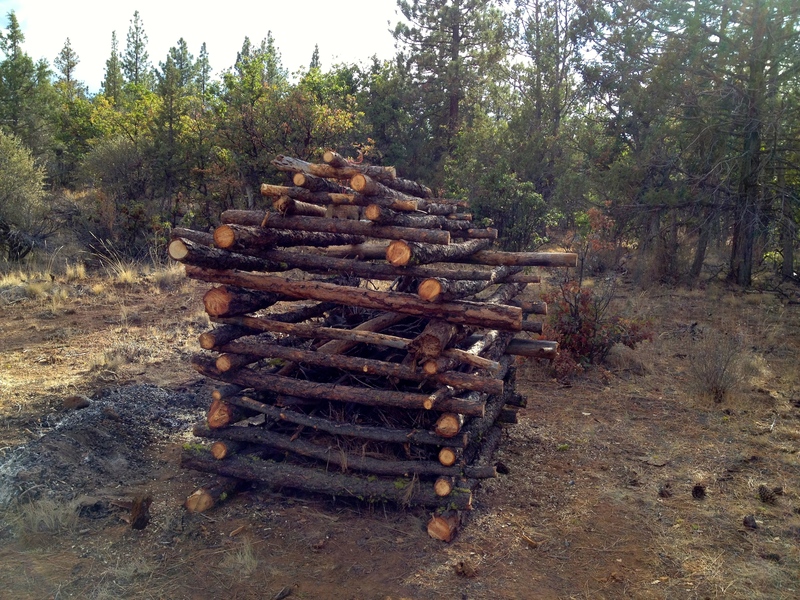 Once we’d collected a large pile of logs, we proceeded to stack them into a vaguely cabin-like shape, then filled it with dry tinder. So, am I done? No. But the burn gave me a sense of finality. And every time my mind wanders back to her, the things I said or didn’t say, or the adventures we never went on, I remind myself: Let it go. You burned that cabin, remember? 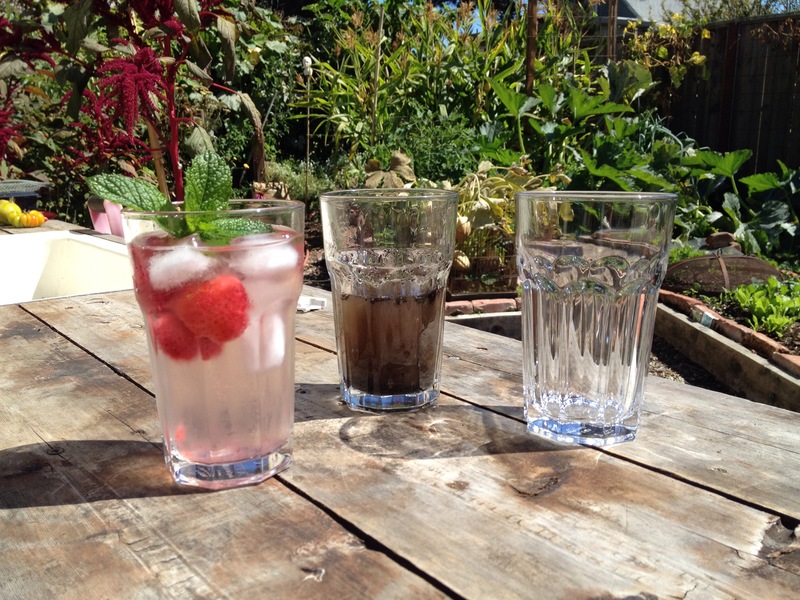 Are you a “glass half full”, or a “glass half empty” kind of person? I’m sure you’ve been asked this before. The point of the question ostensibly is about whether you’re an optimist or a pessimist, and the lesson is that any given situation can be seen positively or negatively depending on how you choose to see it. How nice. One day an important man, a man used to command and obedience came to visit a Zen master. “I have come today to ask you to teach me about Zen. Open my mind to enlightenment.” The tone of the important man’s voice was of one used to getting his own way. In the context of Zen, the teacup is a metaphor for the mind, and how, through meditation, we can clear our minds of thoughts, ideas, beliefs, and expectations that often hinder us more than they help us. Once we have cleared our minds, there is finally room for truth and enlightenment. Emptiness/fullness can also be used to describe life itself. When someone says “my life feels empty”, that’s considered a bad thing. And conversely when someone says “my life is full”, that’s considered good. But, many of us, at one point or another, probably had/have “full” lives that were/are nonetheless stressful and unfulfilling. The fullness might come from obligations and responsibilities that we don’t find nourishing, but nonetheless occupy our minds and bodies from morning to night so fully that it leaves us with no time to connect with ourselves and loved ones. The “fullness” prevents us from working towards or exploring a better life. This kind of “fullness” could hardly be said to be good. After I quit my job back in mid-May, I’ve struggled with feelings of emptiness. I would wake up in the morning, and there would be no job or purpose awaiting me. No responsibilities, no obligations. Nobody waiting for me or relying on me. Just, emptiness. I found myself oscillating between trying to plunge myself into a project, or distracting myself by mindlessly staring into my computer screen. I doubted my self-worth. It challenged my work ethic. I even contemplated employment. Instead of doing anything drastic, like getting a job (which I know I would hate as soon as I got), I decided to sit with this uncomfortable feeling of emptiness, and let it run its course. I’ve always had a difficult time dealing with uncomfortable feelings and situations, but one of my intentions over the past months has been to learn to live, confront, and play with uncomfortable things. So, how convenient it was that I would often wake up with this big hairy beast called Emptiness sitting on my chest? And over the course of weeks and months, an interesting thing happened. I came to see this emptiness for the gift that it is. For “emptiness” is really just another word for “freedom” and “opportunity”. An empty glass can be filled with anything. I am about as free as any man has ever been in the history of mankind. And that’s no understatement. I am bound by fewer social and cultural norms and obligations than just about anyone in history. I don’t have a boss. I don’t have a wife or kids. I have few financial obligations. I have mastery over some of the most complex and powerful technologies the world has ever seen. I can make practically anything. I have the ability to go anywhere in the world, and do just about anything I damn well please. I can enter any relationship, any occupation, any adventure that comes my way that I choose. And I can do it at the drop of a hat, because I’m an empty glass. Granted, not everybody is as lucky as I am, but regardless of your circumstances, if you have a glass that is half empty/full, I suspect one of the following two cases is often true: 1) You enjoy what’s in the glass, and you want it to be topped off, or 2) You’re not enjoying what’s in the glass (any more) and you want the glass to be empty, perhaps so it can be filled with something else. Of course, actual life is never that simple. We’ll never have a life full of just the good stuff, and we’ll never empty our lives completely. But, instead of thinking about whether the glass is half empty or full, we should think critically about what is in there, and what is not. We should be mindful about what we put into our lives, because for every thing that we put in, we reduce space for something else. And we shouldn’t be afraid of taking things out of our lives, to free up space too. As I sat in a toilet stall in Terminal 1 of the Minneapolis St. Paul airport, I thought to myself, “this is nuts”. There I was, depositing my output in a pool of potable water, about to flush it with even more potable water, to be sent to a treatment plant where the sewage would be processed using electricity generated in large part by burning coal. No part of that made any sense. Twenty-four hours and a few hundred miles prior to that, I sat similarly in a communal stall, except this one was over a bucket. When I was done with my deposit (lovingly called “contributions” by residents), I had simply covered it up with a bit of saw dust. The bucket would be carried down to the compost heap, and a few years later, the resulting compost would be spread in the garden to enrich the local clay-y soil, which in turn would help produce food to be consumed. That made sense. 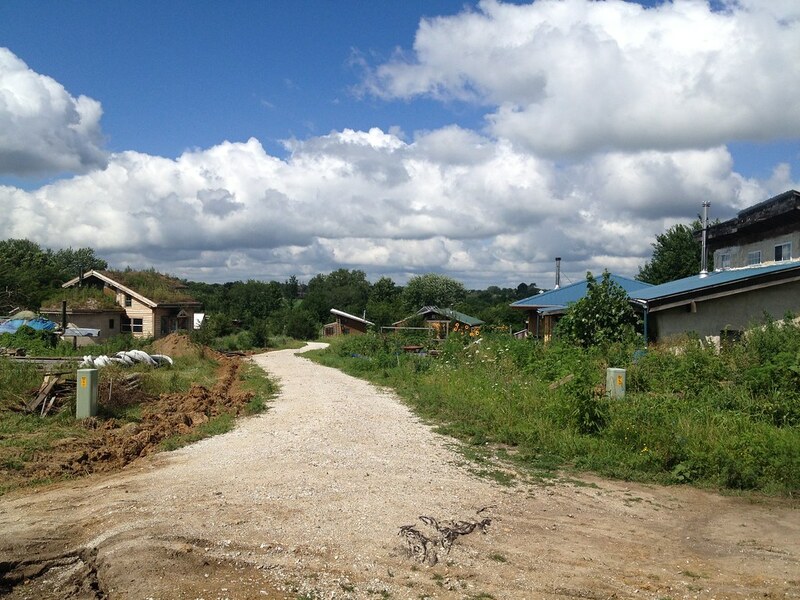 When I decided to visit Dancing Rabbit Ecovillage in rural Missouri, I told some friends that I was visiting a “crazy hippie commune.” I wasn’t entirely serious about the “crazy” label, but even I didn’t quite anticipate how sane the place would feel, and how crazy the “real world” would seem once I came out of the experience. Let me step back. 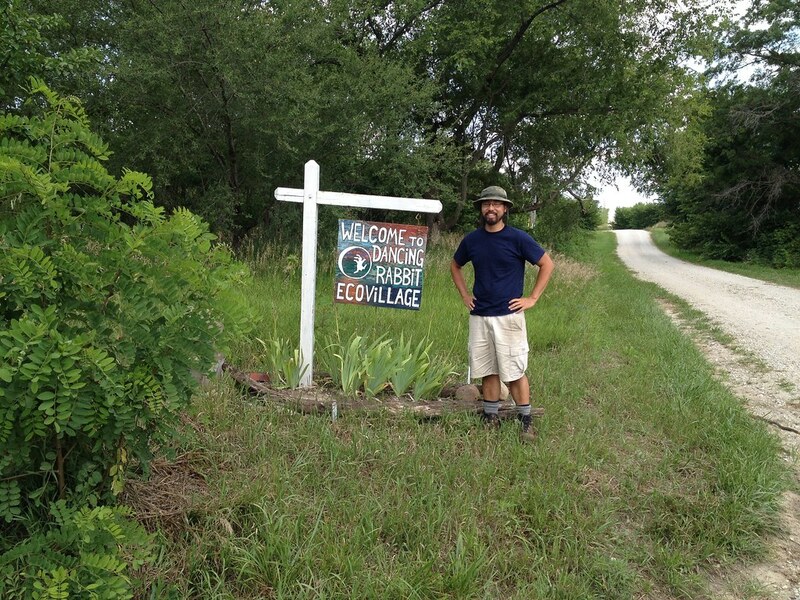 In late July, I spent several days at Dancing Rabbit Ecovillage to attend a workshop. 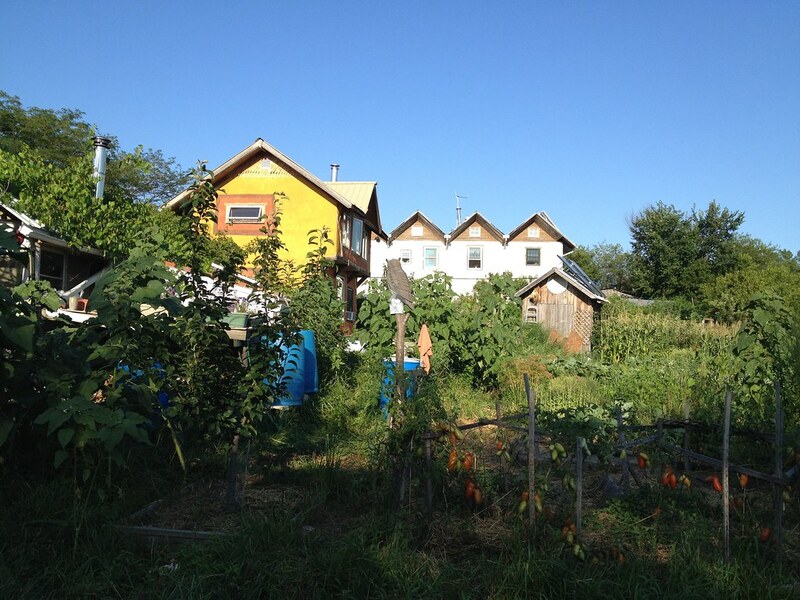 Located in north-eastern Missouri, about 3 hours from St. Louis near the town of Rutledge, Dancing Rabbit (DR) is part of a cluster of 3 sustainability-focused intentional communities (the other two communities are Sand Hill and Red Earth farms). Originally founded in the late 90s by a group of young Stanford and Berkeley grads from the Bay Area, the village today is home to some 40 to 70 residents and visitors of all ages, including over a dozen children. They live in accordance with a small number of covenants, most of which are designed to make life more environmentally sustainable, while still allowing for enough flexibility to be accepting of a range of personal preferences in areas such as diet, technology use, spirituality and community involvement. Perhaps one of the most noticeable physical characteristics of the community is its structures (see pictures). In addition to one large dorm-style two-story straw bale building, most members live in a wide variety of shelters, ranging from tents and converted busses and shacks, to beautiful and modest yet comfortably sized single family homes. What gives the place and its structures a distinct look is probably the combination of one of the covenants (that all structures use natural materials and locally harvested or reclaimed lumber) and the county’s lack of building codes. The covenant banning new lumber has practically forced folks to replace traditional stick-framed construction methods and factory-made materials with beautiful local natural materials, while the lack of building/zoning codes has allowed for experimentation and creativity. Since there are no codes to dictate minimum house sizes or densities, and there’s no requirement for homes to have road frontage, the village is densely inhabited but with enough green spaces and gardens interspersed such that it doesn’t feel crowded. I was also told that warrens (as plots of land are called there) and structures were planned specifically to encourage interaction among residents. I was impressed with the community’s commitment to environmentally sustainable practices. Although the village is now hooked up to the electricity grid and city water, they are incredibly mindful of those resources. Most folks seem to be living off of harvested rainwater, and I heard the community generates 3-4x more electricity through solar panels and wind turbines than it uses (they got tied to the grid to be able to charge an electric vehicle, essentially using the grid as a buffer, which IMO is probably more environmentally friendly than the alternative: a big bank of lead-acid batteries). Some people use gas for cooking (though I did see quite a few solar ovens and a couple of cob ovens), but they rely on passive heating and locally harvested firewood for warmth in the winter. They also share just 4 cars among the entire village, and supposedly use something like 94% less fuel per person than the average American (on driving). Overall, other than the restrictions around building materials, the sustainability practices seemed quite similar to how I’ve lived on my property. What impressed me most, though, about DR was the fact that the community functions at all, and has for almost two decades. It’s one thing to get a bunch of idealistic young hippies together in one place. It’s another to go from 6 to 60 people, and have a community in the middle of nowhere where people can live reasonably comfortable lives. Granted, even in my short stay, it was clear that not everything was peachy. The last of the original founders had just left indefinitely a few days before I got there, and I caught glimpses of some large disagreements about the future of the community. Nonetheless, it appeared that they had figured out an economic model and governance model that was functional and self-sustaining, which alone is quite impressive. Since I mentioned it, I’ll try to briefly describe their economic and governance models. Keeping the cost of living low seems to be a priority, and most residents pay land use fees (I think on the order of tens of dollars a month, depending on home and lot sizes) as well as 2% of their income. Sources of income seemed to vary quite a bit: food stamps, trust funds, working in the village or for the nonprofit, working online, renting cabins, etc. The village and umbrella non-profit organization also makes money from hosting workshops and visitors, but it wasn’t clear how much that accounted for the village’s revenue. Other than that, people pay for their own needs, in some cases by buying into individual co-ops (for food, for transportation, for showers, for power, etc). As far as governance goes, they have an interesting streamlined version of a consensus-based model, where functional areas are broken into separate committees. The committees are responsible for taking proposals through a consensus-based process, but eliminates the need to have everybody in the village in the same room at the same time for all decisions. There’s also a village council and a system called “power levels” that delineates what kind of decisions can be made where (I think) but my understanding is murky on those areas. When I think back at what it was like there, this is what I experience in my mind: Wind turbines whir overhead, the sound intermixed with the laughter of children playing on the dirt paths as a couple of old dogs look on and a pair of ducks waddle by. The people seem relaxed, and happier. They stop to interact with each other. All around, we’re surrounded by the green hues of trees and gardens, the blue of the sky, and the bright yellows and oranges of colorful houses blending into the landscape with more crooked lines than straight ones. It’s pretty damn idyllic. My first moments of arriving at DR reminded me of the trope often seen in post-apocalyptic narratives: the promised land where people live happily and peacefully, free of whatever ails the world around them. Here, I thought to myself, people live sane and sustainable lives, in community. It combined aspects of what I loved about living on my property, with what I’ve been searching for more recently: a community. It opened my mind and eyes in the way that my first Burning Man did; it made me realize that another kind of life and society was possible. I don’t know if DR, specifically, is my ideal. But it made my ideal a little bit less of an abstract dream, and more of a reality than it ever was. Yet, when I step back, big questions also loom in my mind. As impressive as it is that this community that started with half a dozen dreamers has grown to a village with dozens of people, is this The Answer? Some folks at DR want to grow the village to a 1000 people, which seems like quite a challenge. And even if the model could be replicated 1000 times over, which, again, sounds like quite a challenge, that’s still only 1 million people out of the over 300 million people in our country. And, let’s not forget the rest of the world. There are around a billion people who live in rapidly developing countries where, over the coming years and decades, they may achieve the kind of affluence that will allow them to live increasingly energy and resource intensive lives. So, in the grand scheme of things, getting a large number of people to slightly change their behaviors might be far more impactful than getting a tiny number of people to live drastically different (albeit sustainable) lifestyles. This conundrum may, in many ways, be at the root of my inability to choose definitively between a rural life and a life in the city. I am happier in a rural setting, and I want to live a lifestyle that is congruent and consistent with my values. But what draws me to the city, at least partially, is the promise to affect change from the belly of the beast. That is the promise of Silicon Valley and the San Francisco Bay Area: it’s the place where a great deal of technological, cultural and social changes were/are born and disseminated throughout the country and the world. Even Dancing Rabbit started there, before moving to Missouri. But, then again, Silicon Valley’s focus these days seems to have been redirected more towards getting rich quickly, rather than changing the world for the better. And I haven’t figured out how I can orient my skills and experiences to push for a more sustainable world in an impactful way. Perhaps nobody has. I’m returning to Dancing Rabbit in October for their 3 week visitor program. 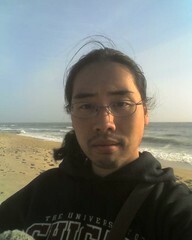 My intention is to learn more about the inner workings of DR, and to also more fully experience life in an ecovillage. But, in the back (or front) of my mind will be this question about where and how I want to live, and how I want to orient myself to engage the world. I don’t expect to have answers. But I hope to have another piece or two to fit into the puzzle of my life. 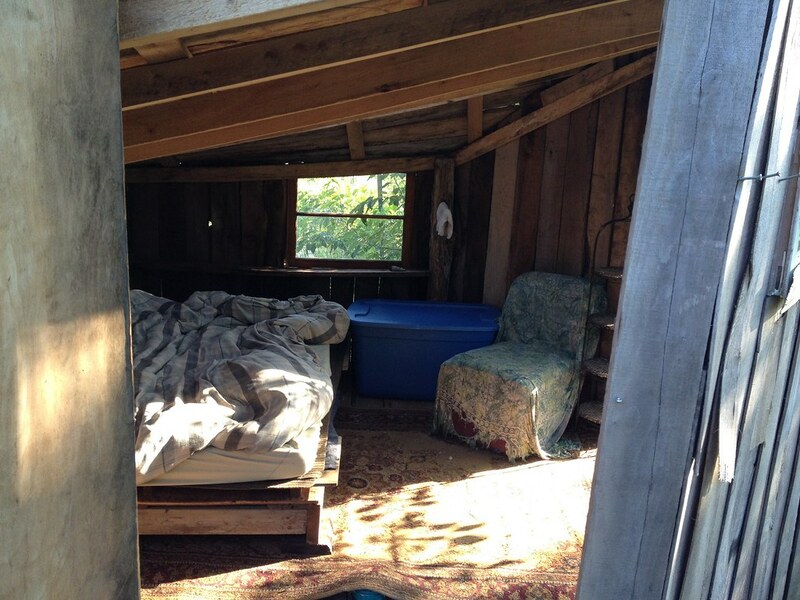 I’ll be living in this cozy little “Summer Cabin” when I return in October! I just got back from 2 weeks in the desert (for Burning Man) and realized I never posted the “all clear” post, so here it is. My property was spared from the fire, though just barely. The picture above was taken just a few hundred yards from my property fence (and there was a spot fire just 50 yards from my fence), and when you consider that the fire started 5 miles away and burned 50,000 acres, that’s nothing short of a miracle (well, and firefighters doing a great job). In the aftermath of this close call, I decided to invest in an Oregon 40V battery-powered chainsaw so I can clear more/bigger brush faster than I currently can with my 18V reciprocating saw. I’ve also been thinking about thinning out my pine trees to help them grow bigger and stronger, especially given current drought conditions. Normally, periodic natural fires would do the thinning, but I think that responsibility falls on me at this point. I’ve so far only used the chainsaw for one afternoon, but I’m pretty happy with it. The biggest piece I cut was a 9″ diameter fallen pine log, which it cut just fine. I also got a spare 4Ah/144Wh battery, and had no trouble keeping the chainsaw powered, though I also wasn’t using it constantly since I used my reciprocating saw for small branches. One advantage of an electric chainsaw is that it’s easy to start up, and it’s super quiet, which also makes it less scary to operate. Also, for sporadic use, it’s also nice that you don’t have to choose between idling a gas engine or stopping it and having to start it back up constantly. 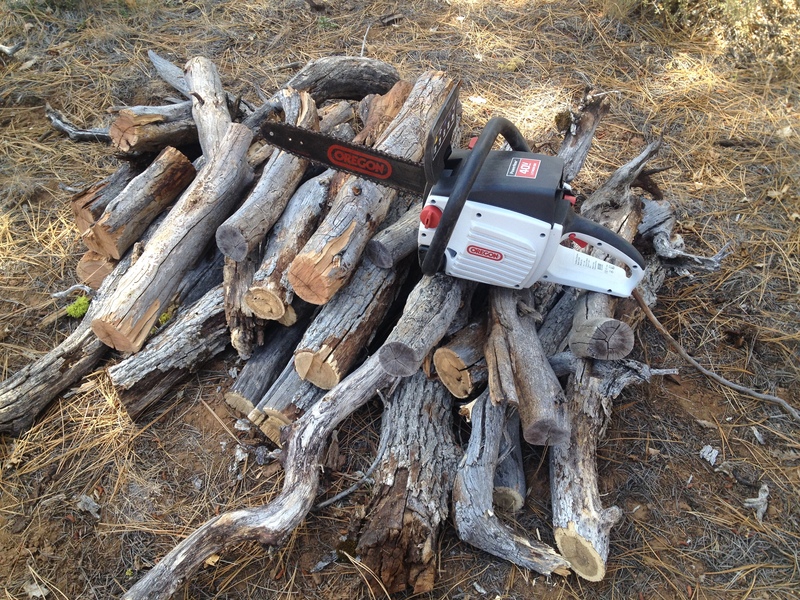 The biggest downside is cost: the chainsaw with two 4Ah batteries set me back $650. I decided it was worth it because I care a lot about not having tools that depend on gas, but for others, that might not be enough of a reason. It’s also somewhat underpowered if you actually plan on cutting down trees bigger than ~10″ in diameter. I’m also hoping to eventually mill my own lumber, and for that, I might get a corded electric chainsaw that I can run directly off my solar-battery array through an inverter. I was heading up to my property on Saturday, just like I would any other time, when I saw a giant column of smoke in the general direction of my property once I got to the nearest city, about 1.5 hours away. I looked online, and found that there was a massive fire within miles of my property. I headed up to towards my property, fearing the worst, but knowing that there wasn’t much I could do one way or the other. I got stopped at a road block about 45 minutes away from my property, due to a different fire. Fortunately, the cop told me of a way to get around the roadblock, and I was able to get on the county road towards my property right around dusk. I expected to get stopped, but there were no road blocks, and I checked in with firefighters huddled by the road to make sure it was safe, and nobody told me not to continue. It was a huge relief once I got to my property, and to see it still unscathed, for the moment — there were plenty of signs that this one might be close. The ground was littered with ashes and bits of charcoal, and orange fire retardant had been dropped on my cabin and surrounding areas. The air was thick with smoke, and even though I tied a wet towel around my face, there were moments when I felt light-headed and almost asphyxiated. I spent most of the night doing what I could. I first loaded up the car with things worth saving (mostly things of high replacement value or high sentimental value), then I spent a few hours fireproofing my cabin. I’d read that structures tend to catch when burning embers get in, rather than from radiative heat that comes from a nearby fire. So I cleared flammable debris from the base of the cabin and put up a skirt to keep burning embers from getting underneath. Then I took down the gutters so that embers wouldn’t gather there, and I used heat-resistant foil tape to cover some exposed wood and foam insulation. I also cleared dry and dead vegetation from around the cabin. Throughout the night, I also took frequent breaks in my cabin. I put on some music, ate some food, and sat there as I would on any normal night, trying to enjoy and appreciate the chance to spend some time there, perhaps for the last time. It felt like seeing off an old friend. Even though I’ve only had it for a few years, it was shelter. It protected me from the sun, the wind, the rain, the snow, and -10F nights. It was the one place I could come to, no matter how rough life got, and stay for as long as I needed. In some ways, the cabin was the most dependable friend I’ve ever had. Until now. It was also a good reminder that nothing lasts forever. Life sometimes feels like nothing but a lesson in letting go. Letting go of the old to let in the new. And in some ways, that’s what this forest fire was about. Fire is part of the ecosystem. There are seeds that only sprout when there’s a fire. Fire maintains balance and nourishes the soil. 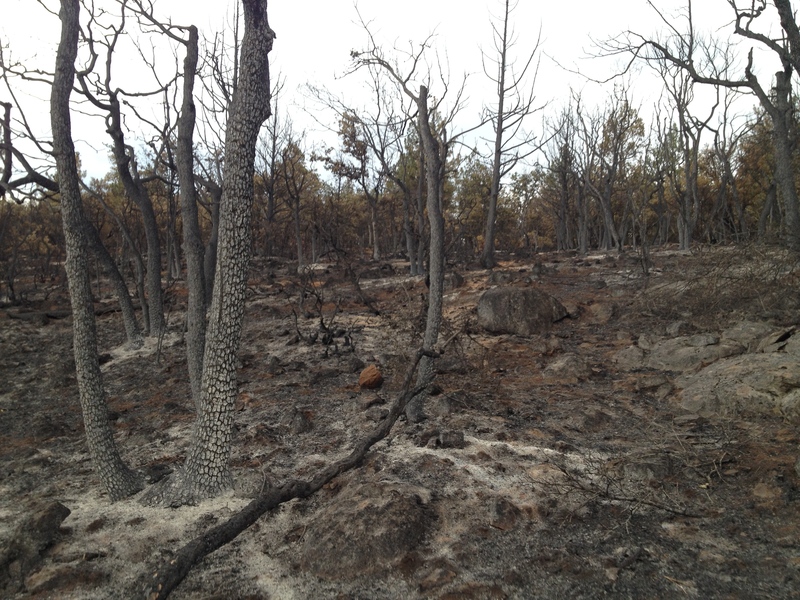 Sure, the fire ecology here is out of balance… but that’s our doing. By not letting ourselves allow for healthy burns, we’ve set ourselves up for unhealthy burns. This seems like an important lesson, in all aspects of our lives. I worked until 4am, then decided to take a nap. Partially because I was tired, but partially because I wanted to sleep in my cabin, one last time. But I also knew that, even though the fire was staying put, that anything was possible once the sun came up and the winds started blowing. So I allowed myself a 2 hour nap, got up, finished packing, shot the video, and headed into town. They shut off the road for good just as I was leaving. Last I heard, the fire, which has burned tens of thousands of acres, had reached a road 200 yards from my property line the day before I was up there. That line seems to have held so far. I really liked the combination of gear I took with me on my recent backpacking trip, so I thought I’d do a post about it. 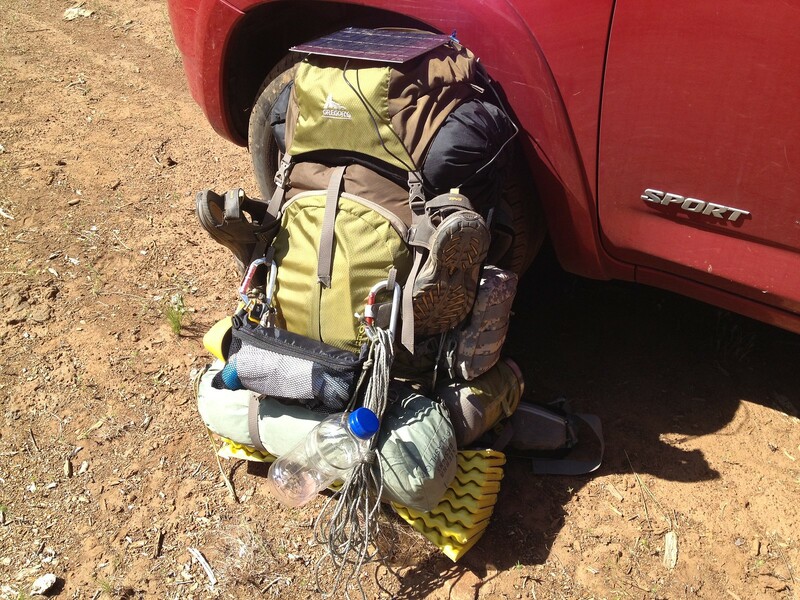 It’s not a large amount of gear, but I had no trouble keeping my phone charged (for navigation) or running a reading light at night, and didn’t have to worry about running out of cooking fuel or clean water. Basically, just 5-6 pieces of gear took care of many of my basic needs, and could do so practically indefinitely, which I think is pretty cool. The post below covers many of the same points as the video above, along with links to the products I talked about. BootstrapSolar Chi-qoo – I designed this myself, so of course I like it. But, specifically, what I like is the compact but powerful 5W solar panel, which can be mounted on top of my pack to gather sun when it’s high in the sky. Many competing designs will have solar panels mounted vertically on the back of the pack, which doesn’t get as much exposure. Also, I think 5W is the right size. Anything smaller and you won’t generate enough power. Anything larger and you won’t be able to mount it on the top of the pack and so you won’t actually get as much power. The charger also has a nice big 6000mAh/22Wh battery pack, so a full charge will give you 3+ recharges of a smartphone right off the bat. I also like that the battery pack has 2 USB ports, so you can recharge/power up to two devices simultaneously. 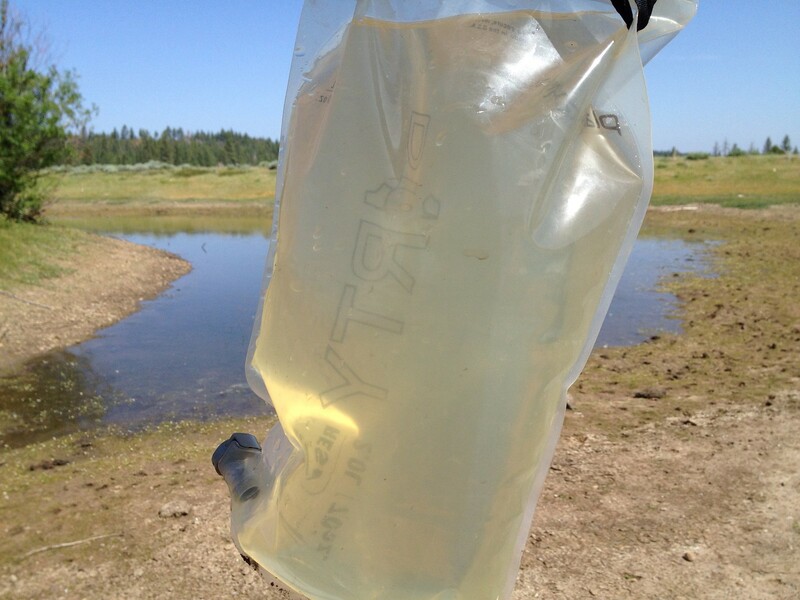 Steripen Ultra – I carried 3 forms of water sanitization (not counting boiling) and the Steripen is, in some ways, the one I trusted most because it can kill things filters can’t get. Filters generally don’t effectively remove viruses because they’re too small, though they can be destroyed by the Steripen’s UV light. The only downside is that it takes 1.5 minutes to sterilize a liter, and when you’re filtering 6 liters every morning, it can be a drag to sit there stirring that pen. On the other hand, unlike filters that eventually need to be replaced, the Steripen will keep going as long as you have power. Bosavi Headlamp – In the past, I used a cheap headlamp that ran off of AAA batteries, but keeping those batteries recharged was a pain (in addition to requiring a separate battery charger). So I went looking for a headlamp that could be charged from the Chi-qoo’s USB port, and found the Bosavi. It’s got a bunch of different settings, including 2 different types of white light and one red LED, but… yeah, it’s a headlamp. It works. I can keep it recharged indefinitely. That’s good enough for me. GoalZero Luna USB lamp – At night, I used the Luna in my tent to read a book (yeah, how decadent!) or study the map to plan the next day’s hike. It runs beautifully from one of the Chi-qoo’s USB ports, and it’s bright enough to read with without any discomfort. The bendy cable/neck is a pretty useful feature too, so I could plug it into my battery pack and put it on the floor or in a side pocket in the tent, then reorient the light as I wanted. 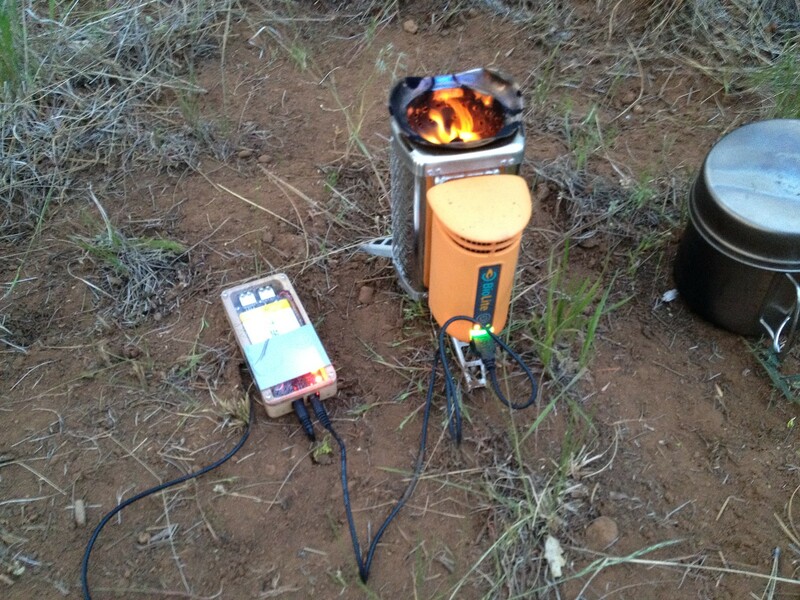 BioLite stove – I really like the BioLite stove. It’s basically a portable rocket stove that has its own thermal electric generator to power a fan. I like the BioLite + Chiqoo combo because some things (like the Steripen) won’t always charge directly from the BioLite, probably because the BioLite won’t always output enough amperage. But the Chiqoo is designed to charge off of unstable power sources (like solar panels) so it’ll happily take whatever the BioLite can output. As far as backpacking stoves go, the BioLite is heavier than many modern gas-powered backpacking stoves, but then, if you’re in the woods, you don’t have to worry about running out of fuel, so that’s a pretty big plus. It could be tricky to get going (I found that tipping it sideways to get the kindling going, then turning on the fan and setting it upright works best), but once it’s going, it burns very hot and very cleanly, thanks to the rocket stove principle. I also use it as a mini-campfire at night, so I’ll just sit there and zone out while throwing sticks into the fire and staring at the flames. Caution: If you use one of these, I would strongly recommend having s’mores ingredients handy, or you’ll wish you did. I’ve gone on a couple of solo backcountry backpacking trips, and both occasions proved to be excellent opportunities for introspection and reflection. There’s something about paring my life down to the very bare minimum and spending my time in nature that allows me to go deeply into myself, and to confront parts of myself that I otherwise might run/hide from in an ordinarily busy life. I’ve also found that backpacking in particular, of all activities, seems to have many parallels to life it self. Here are some “life lessons” that I’ve extracted while backpacking (though, I must add that these are lessons that I find myself often having to relearn). It’s a process, not a destination – Backpacking is one of the relatively few activities where it’s really about the process rather than the results. That is, every minute of backpacking is backpacking. It’s backpacking when you’re walking, it’s backpacking when you stop to admire the scenery, it’s backpacking when you’re in your tent, it’s backpacking when you’re pooping in a hole, it’s backpacking when you’re cooking, it’s backpacking when you’re eating. Every minute of it is backpacking. And life is like that too, though it’s easy to forget. I think it’s easy to get into a trap of thinking like life will happen once you’ve achieved/obtained/finished this or that. But the reality is, every minute of life is life. It’s life when you’re working, it’s life when you’re playing, it’s life when you’re sad, it’s life when you’re happy. It’s life when everything seems to go wrong, and it’s also life when things go well. Every minute of our existence is life, so we should do what we can to make the most of it. 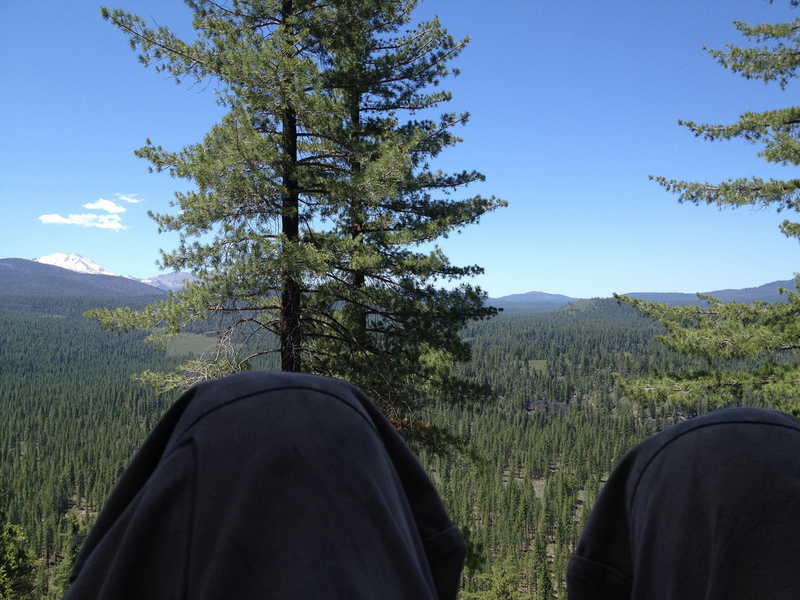 It’s hard, most of the time, and that’s normal – Backpacking isn’t exactly a picnic at the park. You have a heavy pack, you’re probably hot or cold, you’re dehydrated, the food isn’t great, your feet hurt, your shoulders ache, your hips are chafed, there are bugs and filth, maybe there are bears or snakes, and you’re never there yet. But if you love backpacking, you learn to accept all of this. Sure, you try to make yourself comfortable as much as possible, but I don’t think any backpacker has illusions of it generally being easy or comfortable. And once you accept that it is what it is, you barely notice the discomfort and you become more receptive to the good parts. I find that life is like that too. Life is hard. If you delude yourself into thinking that it should be peachy all the time, you will be dissatisfied, frustrated and maybe depressed most of the time, and if you’re dissatisfied or frustrated most of the time, you won’t be in a mindset to appreciate the finer moments. But if you accept that life is often hard, and things don’t always go the way you want, then it paradoxically becomes easier to accept setbacks unfazed and appreciate those good moments. You need less than you think – Whenever I go backpacking, I’m struck by how little I truly need to feel happy. Water, food (and not much of it), shelter. That’s pretty much it. Sure, eventually I’ll want to bathe. Sometimes I miss human contact. But I believe it’s important to know what your needs are, vs what your wants are. Needs are things that keep you alive and physically or mentally healthy. Everything else is a want. Most things in modern society are wants. A big house? A want. A shiny new phone? A want. A nice vacation? Probably a want. The prestigious job? A want. You can tie your happiness and sense of self worth to your wants, but you don’t have to, and don’t worry, letting go of your wants won’t kill you either (that’s the definition of a want). That’s not to say that you shouldn’t get things you want. But I find that I appreciate getting what I want more, because rather than feeling like I’m getting something I’m entitled to, I can feel like I received an unexpected gift. The things you carry should nourish you – You might think of backpackers as “people who walk around with big heavy packs”. And to some degree, this is true. But the point of backpacking isn’t to walk around with a heavy pack. The heavy pack is there as a necessity, so that we have what we need to keep going. That also means, though, that there’s no reason to carry things that we don’t need. In fact, many backpackers religiously reduce waste, shaving grams and ounces where ever possible. When you’re backpacking, anything you carry that doesn’t serve you in some way is basically unnecessary baggage (more on this below). In our society, I think it’s easy to think that the goal is to collect as much stuff and responsibility as we can. After all, if you have a bigger house, more money, more kids, and a fancy job title with big responsibilities, we’d probably call you “successful.” But, does that really make us happier? For some, maybe, but for others, maybe not. I think the analogy of the heavy pack is one worth keeping in mind. When you’re thinking about adding a new burden to your life, whether it’s a mortgage, or a car loan, or a child, or a fancier job, I think it’s worth asking “Is it really worth adding this burden to my life?” And if the answer is no, don’t put it in your “pack”. If whatever you’re signing up for doesn’t nourish you, it’ll just weigh you down. Carry your own baggage – When you’re backpacking, you should try to be as self-sufficient as possible. Sure, if you’re with a group or with another person and you want to distribute the load, there’s nothing wrong with that. But, as a general rule, you should carry your load, and this is particular true if you have ‘baggage’ (as defined above, something you’re carrying that you don’t need). I believe this holds true in real life too. As someone who admittedly has perhaps a bigger load of historical baggage than others, this is perhaps the one lesson I struggle with most. But, it’s one I like to remind myself often, and if someday I am fortunate enough to find someone to share the load with, I would like to think that I’d be able to carry my own baggage. If the spring is dry, go to the next one – When I’m backpacking in the backcountry, I rely on springs (or ponds, streams, lakes) for water. Water, of course, is absolutely necessary to survive out there, so there’s inevitably a strong emotional attachment to finding water at the springs I visit. Naturally, and especially on a draught year like this one, many springs are dry, or barely give a trickle. It’s easy to be frustrated, or maybe even be slightly panicky, but that’s just a waste of energy. If this spring is dry, the sooner I can accept that and move on, the sooner I’ll actually get to water. We find “springs” in life too, to provide things we need. Maybe it’s a dream job, maybe it’s that cute girl/guy, or a high profile gig. Whatever it is, we want it, and we want it bad because we think it’ll give us something we need. Often times, it doesn’t work out. We don’t get the job, the girl/guy rejects us, or we don’t get the gig (or if we’re having a bad day, all of the above). As upsetting as it could be, the sooner we accept that we didn’t get what we wanted and move on, the sooner we will find the job, girl/guy, or gig that does work out. Know your North. Know your bearings – If you were to stop me in the woods and ask me which way was north, I’d be able to tell you. If you don’t know which way is north, you can’t navigate, and if you can’t navigate, you can’t know where you are or where you’re going. You’re lost. I’ve never gotten lost in the woods, but I’ve felt lost in my everyday life. I don’t mean ‘lost’ in the physical sense, but more in the sense that my life feels directionless and I find myself muttering to myself “I don’t know what I’m doing with my life.” Upon introspection, it usually turns out that it’s not that I don’t know what I’m doing; it’s usually that I’ve lost sight of what’s important to me — I’ve lost my True North. Once I remember what’s truly important to me, I can usually find my way back, or at least give myself a bearing to head in. Enjoy the scenery – When I’m backpacking, sometimes I’ll find myself in almost a zombie-like state, where I’ll be physically walking, but my mind will be entirely self-absorbed in some thought or another. When I’m in that state, I’m not present, and I’m not seeing what’s around me. So it helps to sometimes stop, take a deep breath, set aside whatever thought is occupying my mind, and take in the scenery. Sometimes all I see is trees. 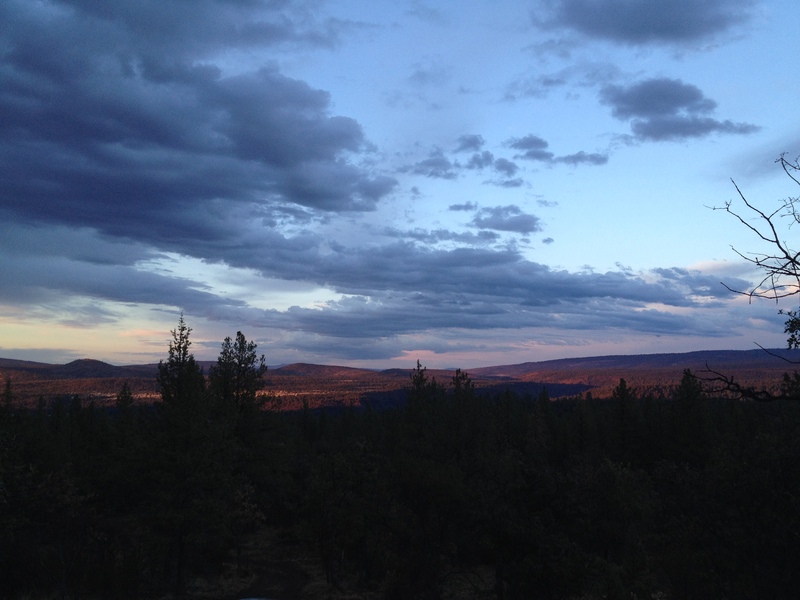 But sometimes I see breathtaking beauty, and all the hard work becomes worthwhile. Life can be that way too. We can get busy living our lives, doing work, running errands, dealing with whatever mini-crisis that has struck that day. But, I think it’s good to stop occasionally, and look around, both literally and figuratively. You may notice something you otherwise might’ve missed. You might gain a different perspective. You might see the big picture, and see that you’re sweating the little stuff. Whatever it is that there is to see, you’ll only see it if you stop and look. For a real adventure, go off the well-trodden paths – Paths are easy to follow without thinking. Sometimes that’s not a bad thing, if the path is taking you somewhere you know you want to go. But, when you step off the path, you need to focus on what you’re doing, and where you’re going. You need to check your progress, check your compass, scan ahead for potential hazards or openings through some thicket or perhaps a way down a rocky slope. It requires thought, focus, perception, creativity and decisiveness. It’s a richer experience than simply following a path, and it can also be hugely rewarding because you might reach a place nobody else has. We are often presented with well trodden paths in life too. Go to school, get a job, get married, buy a house, have kids… It’s all planned for you, and there’s nothing wrong with that. But if you want, you also can step off the path, and find your own way too. If nothing else, you’ll be in for an adventure. Learn to fall gracefully – If you walk enough, you will fall. It’s bound to happen. Learning to fall gracefully can save you from injury or worse. Likewise, if you live fully, you will suffer failures and setbacks from time to time. Learning to handle these challenges with grace will help you ultimately be successful, because if you let a setback stop you or deter you, you’ll never get there. If you don’t learn to accept failure with grace, you also may become more fearful of taking risks, and as they say, no risk, no reward. So, take risks, fail gracefully, then try again and repeat as often as necessary.